I've been working really hard this week on getting quilts done. After all the opinions about the borders on Avery's truck quilt, I decided to simplify what I was doing. I kept the same idea with the bricks, but only one row of them, and I put a narrow border on either side, to isolate them, and unify them. I like it. Thanks you, everyone who left an opinion. I'm now in the process of making a backing for it. It's taking longer than I thought it would because I'm using up the leftover layer cake squares, some odds and ends of kiddie fabrics and some fat quarters. I'll get a picture of it when I'm done. Then, I've gotten a few more of the Great Granny Squares done. There are 11 of them now all sewn together, and I have 2 more all laid out and almost ready to sew up. I think I'm aiming for 20. Both of these projects were started in August, so they both classify as "Newfo's", which are defined as new projects begun during the month, and not necessarily finished, so the have the potential of becoming new UFO's........ hence "Newfo". Barb, who blogs at Cat Patches started this trend back in January, but this is the first month I've participated. She has a linky party going for everyone who started a Newfo in August, which I'm going to link this post to. I've been playing around with ideas for Avery's Truck quilt, mostly in my head. I did a little bit of cutting, in order to get an idea of what one of the ideas would look like. And now, help....... I need opinions..... is this too much? Do the sizes of the border fabrics overpower the rest of the quilt? There will be a greater variety of lights and darks than what is here, but I don't want to do any more cutting until I'm sure this works. What do you think? 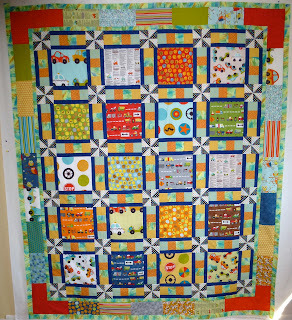 I'm linking up to Judy's Patchwork Times Design wall Monday party. Sunday Stash and Stitchery Report. There are 3 different styles in this package, with 2 of each style, giving a total of 6 to do. They are cute, and fast to work up, which after all those stockings, is a bit of a bonus. And now, remember that road trip we took last Tuesday the involved some fabric shopping? Now comes the rather painful or fun part, depending on the point of view. I think I'll choose fun. I have to add the numbers in. Balance: 71.3 more yards in than out. I think I like having my numbers go up. Fabric shopping is fun, and adds to the variety of "paints" I have to work with in creating more quilts. And it won't go bad, or dry up like an artist's paints can do if left sitting to long. My goal for yesterday was finished, with the exception of one pillow case. And that pillow case is all cut out, and pinned and ready to sew. Another hour should finish it. It's not a very good picture, with part of it in the sun, and it gives a good idea of how the whole thing works. Here's a closer view of the side setting triangles. I tried hooked feathers for the first time on this one. And I did the faux piped binding by machine again. Here's the backing. You can see some of the continuous curves done in the blocks here. And finally, the pillow case. It goes with this quilt, quite well, but I think it will go well with other quilts in my collection, as well. And now, does anyone have an idea for a name for this thing. 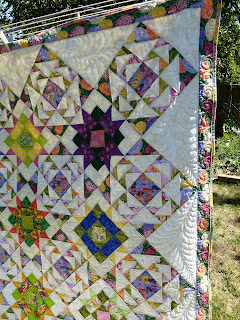 Right now, it is called Spring Swap because the star blocks in the quilt are from an online swap I participated in back in 2010, hosted by Shannon at Pieceful Kwilter. I would like something a bit more imaginative, but I have a terrible time coming up with names for quilts. Edit: after much thought, and a suggestion from Gail which focused my brain on the flying geese in the quilt, I've decided to name this quilt Spring Migration. 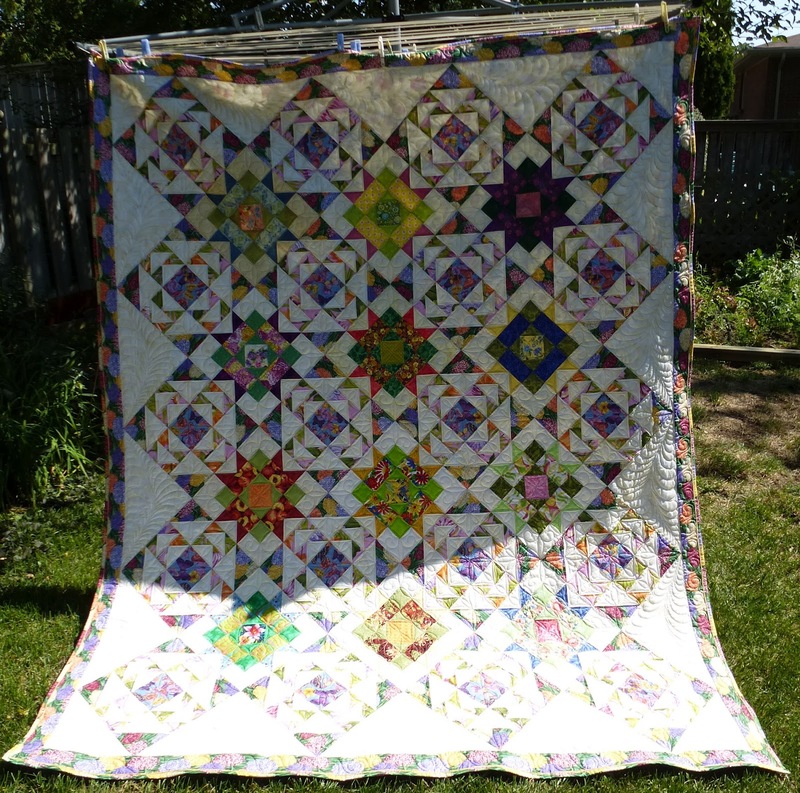 I think it fits with the flying geese in the quilt blocks, and with the fact that the star blocks "migrated" from all over the United States, and even one from Australia. I'm linking this post up to Can I get a Whoop Whoop at the blog Confessions of a Fabric Addict and to TGIFF at Amy's Crafty Shenanigans and to the August UFO reveal at Patchwork Times. I was going to work on the quilt on the machine Monday. But we had errands to run, and then we got side tracked into looking at kitchen designs in the local Home Depot. And then we got even further side tracked by driving across the city to a fireplace design place, because Scott has a fireplace on his list of "must haves" for the new apartment. So, before we can budget for anything else, we needed to know what this "must have" was going to cost. Well, lets just say that his "must have fireplace' has been downgraded to a wood stove. I couldn't believe what the cost would be to install a fireplace from scratch. I like the idea of wood burning heat. That way if we have a bad winter, and the power goes out, we'll still have heat. The other bonus will be that we won't be at Matt and Becca all the time to turn up the heat, if it gets chilly in the basement. And, even though it is only a semi-basement, I fully expect that it will be chillier down there than in the rest of the house. So, there was no quilting done on Monday. Yesterday was spent on the road trip, that I really hadn't expected to make, and it was almost 8 pm before we got home. So, no quilting was done yesterday, either. Road Trip..... and some fabric acquisition along the way. We went on a road trip today. Scott was meeting his daughter, Lisa, for lunch in Hamilton this afternoon, but didn't think he should be driving, due to the vertigo he's been having lately, so I did the driving. It was a lunch for just the 2 of them, so I had to find something to do. Fabric shopping anyone???? I hit the Lens Mills store in Hamilton, and filled the shopping cart 3 times. I was looking for I Spy type fabrics to fill "boxes". I've been wanting to do a quilt named Think Inside the Box for quite a while and I needed 23 different fabrics to put in the boxes, each at a 1/4 yard cut. These fabrics made up trip to the cutting table number one. Then, of course, I simply HAD to get the fabrics for the light/medium/darks needed for the outside of the boxes. These made up trip to the cutting table number 2. Good thing it wasn't busy in there. LOL!! And then, just because I could, and I still had time, I picked up some medium toned large scale florals. These made up trip number 3 to the cutting table. They are all 1/4 yard cuts, so it looks a lot worse than it really is, although, I haven't added it all up yet. I'll do that Sunday, and add it in to the stash report. It was a lovely day, and a lovely drive. I'm glad I went with him. I have a couple of things on my design walls. 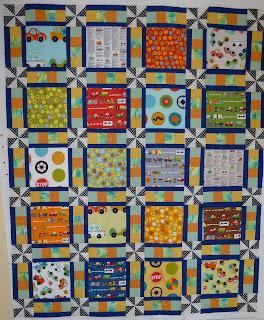 Avery's Truck quilt is about 3/4 finished, or at least the center of it is. I have a couple of ideas floating around in my head for borders, but they haven't quite jelled yet. I discovered something about some of the fabrics in the quilt yesterday while I was sewing with them. The truck fabrics are done by someone in Australia. There are signs on the fabric that are warnings for kangaroo crossings. LOL!! We have deer and moose warning signs, but I'd never even thought about kangaroo crossings. So that puts an added layer of fun to these fabrics. Then the other thing that I've been working on is some of the Great Granny squares. I'm using the fabrics that I picked up at the fabric party I went to a few weeks ago, plus some of my own that work well with them. They are totally outside the style of fabric I tend to use, as well as outside the colours I usually put together, so it has been a challenge, but also a lot of fun. I'm not sure, at this point, where this is going, or how many of them I will end up with. 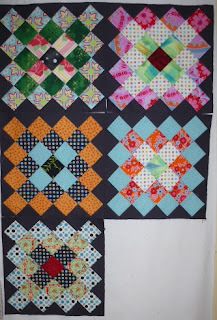 I think I have 2 more blocks laid out, and ready to sew. They actually go together quite quickly. I am loving the look of the charcoal grey as a background colour. It really make the rest of the colours stand out. I suspect there will be more of this particular colour in my future fabric acquisition. There was lots of stitching done this past week while we were away visiting Noel and Laurie and Avery. Noel's stocking is almost completely finished. Just some holly leaves and berries to put on the top corners and I can call it done. WOOHOO!!! I just might make the goal of having all 4 of them finished by this Christmas. There are a set of tree ornaments that go with this stocking that I might start next. Hopefully, those will get done so that I can put them into the stocking. For the stash report, I got a little sewing done this week, before we left, and then after we came home that added to the used numbers a little bit. Balance: 59.75 more yards in than out. 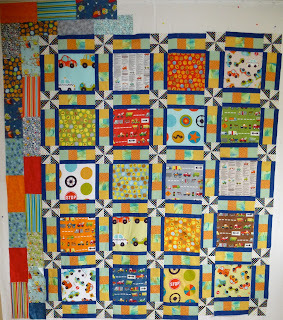 I'm linking up to Judy's Stash Report at Patchwork Times and also to Slow Sunday Stitching at Kathy's Quilts. For the rest of the day, I have to work at 3, but before then, I'm not sure if I'll be doing some sewing, or if we'll be going over to Matt and Becca's new house to give them a hand with unpacking. Well, we're home from our 6 day trip to see Noel and Laurie and Avery. That part of the trip was a lot of fun. 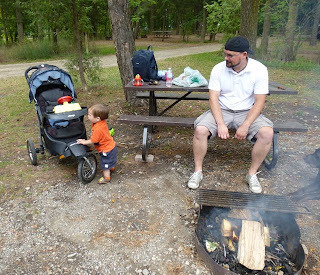 We got to have a couple of cook outs over the camp fire. 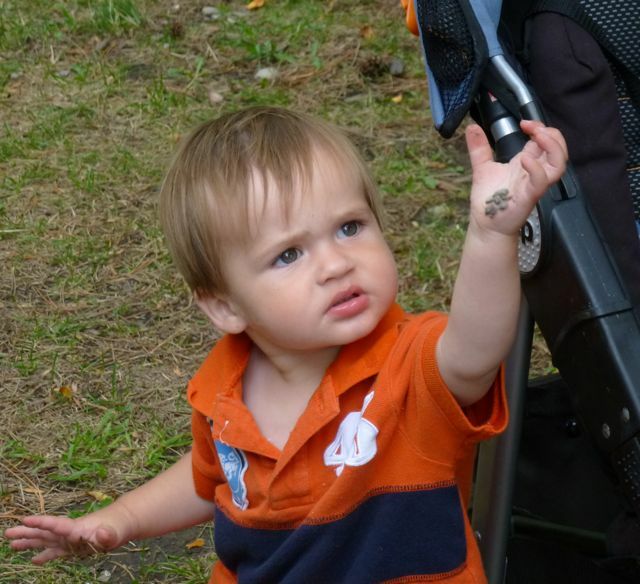 Avery loves to walk around things, chairs, strollers, picnic tables, anything that he can hold onto. He's not so sure of this walking by himself stuff, but he did take 3 or four steps towards me without holding on to anything, which this particular Grammy thought was pretty exciting. Noel was our chief cook and fire tender on this occasion. Avery wasn't too sure what to do with the mud and gravel that ended up on his hands after crawling around or after his many sudden transitions from standing to sitting. And then we got to spend a short afternoon at the beach. Avery loves the water, absolutely loves it. And if he can take one of his favourite trucks with him, so much the better. 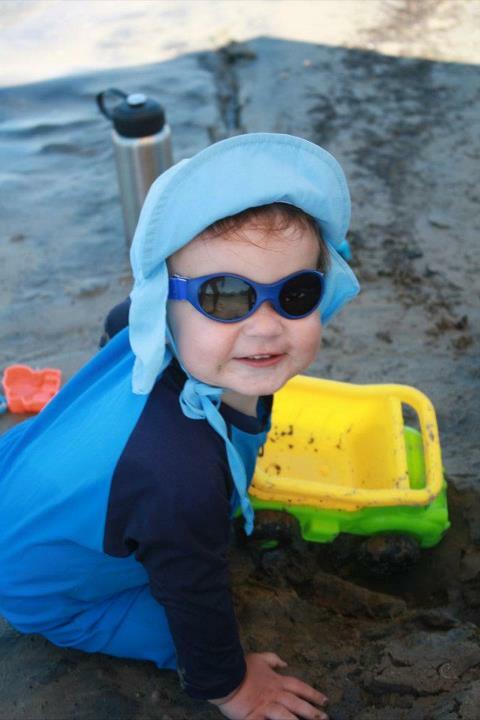 He thinks there is nothing better than getting handfuls of pebbles and sand and filling up the truck with it. 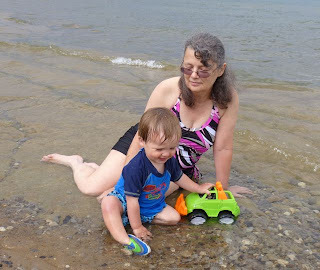 The thoughts of going to the beach and into the water with him, actually got me out to buy a bathing suit, something that hasn't happened in a large number of years. It wasn't a very warm day for this, though, so we didn't stay in the water too long, his poor little teeth were chattering. The rest of this particular camping trip was not the best. It rained, a lot, which is really great for the farmers, and we badly needed it, so that isn't a complaint. And it gave me the opportunity to get some stocking sewing done, and a lot of reading. Our camping neighbours, on the other hand, I will complain about. The first night we were there we were beside a group of 4 young people, but they settled down by midnight, so I thought we'd be OK. Not so.............. this particular group knew the timing and the schedule of the park wardens. So, when the park wardens left at 2 AM, the noise and the ruckus and the bottles and the drinking and the foul language began. They exhausted themselves, or passed out, I'm not sure which, by 3 AM. Needless to say, I was furious by this time, and even once they settled down, I couldn't. And, of course, Scott didn't hear a thing. A guess there is a small good side to his hearing loss. These people left the next day, so I breathed a huge sigh of relief. However.......... they were replaced with a couple who owned 2 dogs, who barked at every sound, every squirrel, every car that drove by and every person that walked by their campsite, or moved around on their own campsite that bordered theirs. And their owners did NOTHING to stop the non stop barking. When the owners left their campsite, they locked the dogs in the trailer, where the dogs then barked non stop until the owners came back. Can we all say grrrrrrrr............. It wasn't the dogs' fault........ why do people get them if they aren't going to do anything with them??? This was the first time in a very long time when I was actually looking forward to getting home. Anyway, that is past and done, and we have another piece of news. 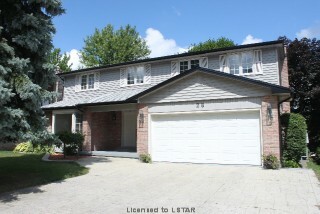 Matt and Becca have bought themselves a house, and are moving into it this weekend. That is so very exciting. So when we got home yesterday, we went over and helped them start to move in. I helped Becca start cleaning out and the arranging the kitchen, which was a lot of fun. But the best part about this house is that they have asked us to share it with them, and become a multi-generational household. There is a large basement under this house, and it opens out to a walkout in the back yard, so it doesn't even seem like it is a basement. 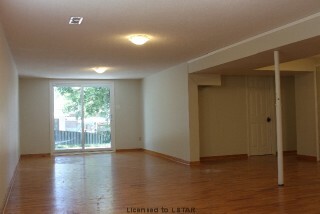 We are planning to put in a kitchen over where the post is that is visible at the right in the picture. There is an existing bedroom and bathroom already in place down there, although the bathroom needs work. We will also be building a studio for me in the garage, so that I can continue to do my quilting and the long arming and continue to have customers. All of this has been checked with the city zoning people, and is good to go. As for the timing, it probably won't all come together until the spring, since we have to get the renovations done there, and also get some repairs done to our house, and get it sold. Very, very exciting, and I will probably be posting more as the renos and building and stuff get started. 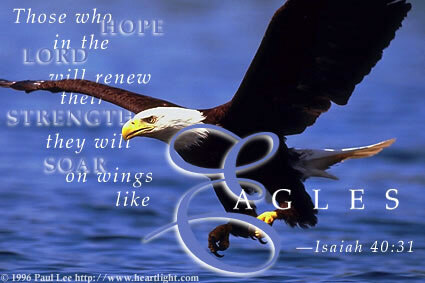 I'm not sure when that will be, though, since we are in the process of finding a reputable person to do the work. Anyway, that's all the news for now, and it is time for me to think about getting ready for work. Stash Report and Stitchery Sunday. 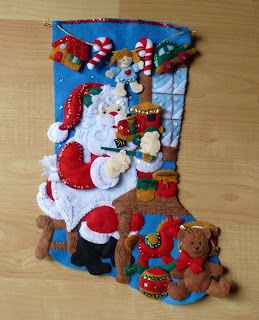 It sure doesn't look like there has been a whole lot accomplished on this stocking. Just the train and the little house. But looks are very deceiving here. That train alone has 16 little teeny tiny pieces! And the little doll that is next to do has 20 little teeny tiny pieces!! I think I need my head examined. LOL!! But, I'm still enjoying doing these, so it can't be all that bad. I'm taking this with me when we go away this week, so hopefully it will be done by this time next week. As for the stash report, it has been a fabulous 2 weeks for usage, which is a good thing, because I had a small amount (ahem........ really, just a small addition, really.......) come in, as well. Look at all those glorious colours!! They were impossible to resist. The light colour in the center of all those fat quarters in going to be the background for an autumn leaves quilt. I know I'm rushing the season, just a bit, and I'm no where ready for summer to be over. But, come this September or October, I'm hoping to be sewing all kinds of lovely leaves. Balance: 60.35 more yards in than out. 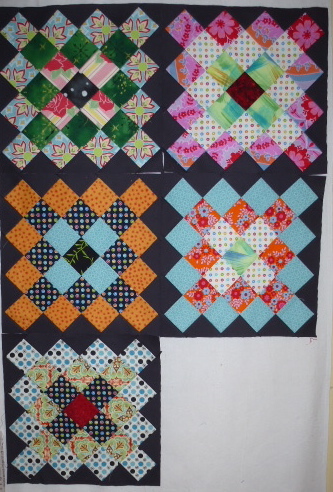 I'm making good progress on that Spring Swap quilt that is currently on the machine. It's almost halfway done. Woohoo!! And I found the block from Australia. It came all the way from Queensland Australia. 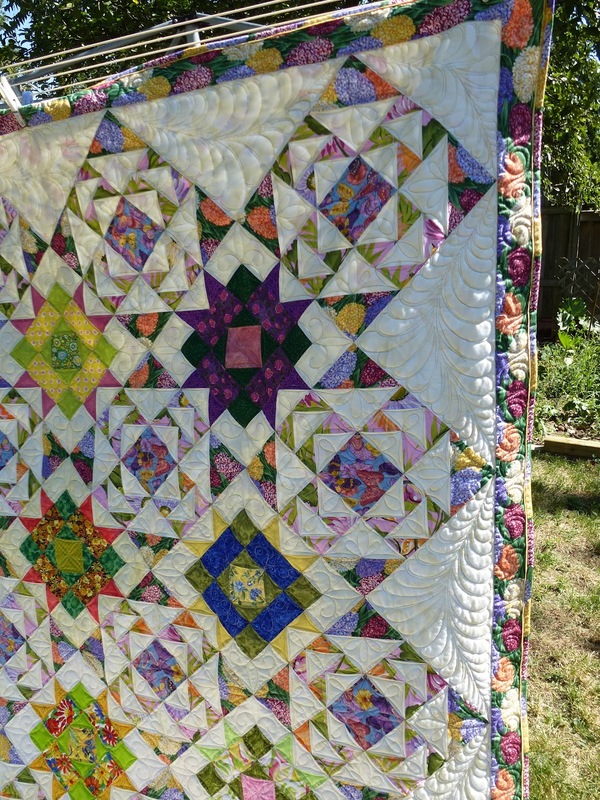 I love the way she fussy cut the flowers in the center of this block. It is so very pretty. It is rather weird, sometimes to think about Australia. It is tomorrow there, when it is today here. It's already Sunday, there. And, it is winter for them in August. Somehow, cold weather and the word August simply don't go together, unless, of course, you live in Australia. Even the sound of that sounds exotic, somehow. LOL!! Anyway, I'm rambling, here, when I really should be working more on that quilt, and also I should be starting to get ready to leave tomorrow for a 6 day visit with Noel and Laurie and Avery. There is some laundry that is awaiting my attention. When I posted yesterday about planning to spend the day in my sewing room, I said I might show what I ended up accomplishing, so here we go, I'm actually going to do that. LOL! First, I finished a customer quilt, and got it off the machine. I can't show pictures of it yet, though, because she hasn't seen it yet. 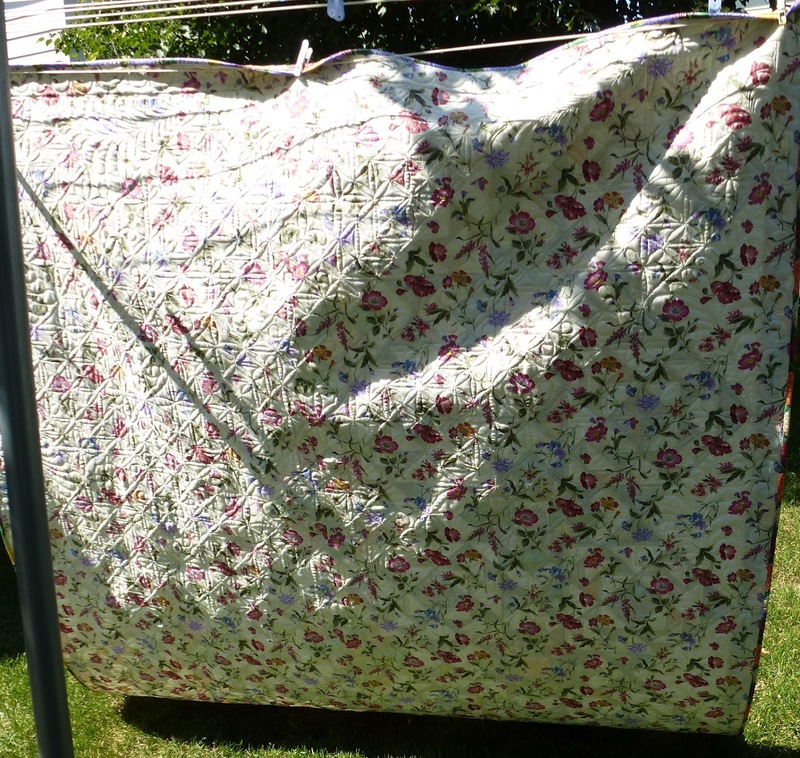 Then I had scheduled one of my quilts to go on the machine. If I don't schedule them in, they don't get done at all. 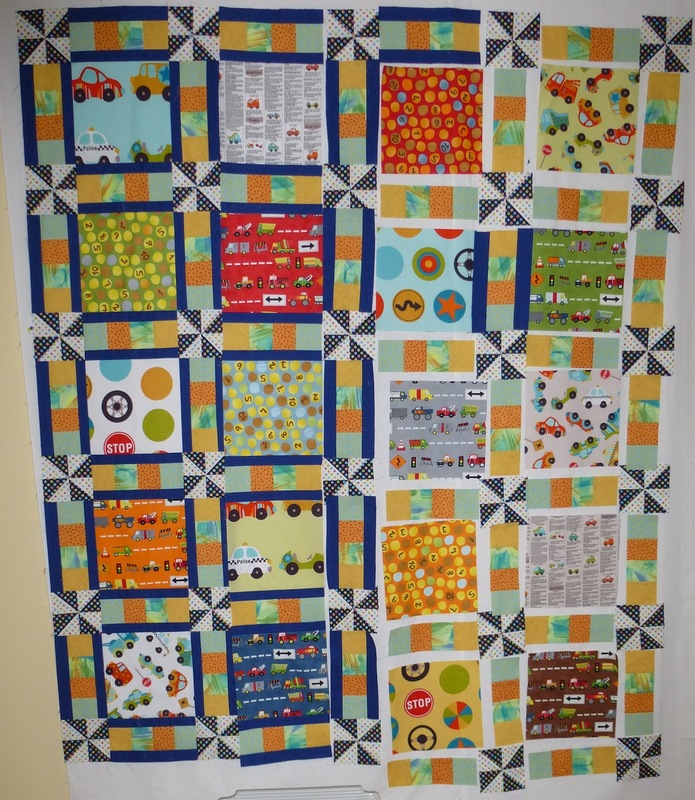 So, I loaded on this month's UFO, figured out the quilting design and got it started. This is a quilt that I did back in 2010. It was a swap hosted by Shannon who has a blog called Pieceful Quilter. She does fabulous work, both in her piecing and applique, and in her long arm quilting. There is actually a block in this quilt from Queensland Australia!!!! I'll show that one when I get to it. I think all of the blocks that I received from the swap were signed, except maybe one of them. It is so cool!! It is going to be fun to quilt. I'm happy with the way it is looking, so far. Then, after my legs got tired from doing so much standing at the machine, I did a couple more Great Granny Squares So now there are five. All in all, it was a great way to spend a day. Jannette came over on Tuesday afternoon, and we had another sew-in afternoon. It was such a lovely time. We're going to try and make it a regular occurrence. It gave me an opportunity to start sewing the pieces together for Avery's truck quilt. It's been a lot of fun working on this one. The piecing is simple, and fast, and the colours are bright and happy. It won't be ready to take up with us on Sunday, though, when we go up to see them for a week. Too bad. But, I'm going back up on September 4th to look after Avery for the first week that Laurie is back teaching, so maybe it will be ready by then. It would be fun to put it down on the floor and see what draws his attention. And then, I have finally caved in and started making some of the Great Granny squares that have been seen floating around blogland for the past month, or so. I simply couldn't resist. I'm using some of the fabrics that I bought at that fabric party I went to, plus some that work with them quite well from my stash. They are easy to do, and a lot of fun to do as well, and so far I am loving them, even if they are made from colours and fabric patterns that I ordinarily wouldn't put together. Sometimes it is fun to step out of the same old box, and into new and different. I can't say that it would ever have occurred to me to put together the colours of red and orange and pink and blue, but it works, and I love it!! These are the first 3. I have enough squares cut out for at least 3 more. I plan on playing with both these quilts today, along with finishing up a customer quilt, as well. It is cool enough today to have the windows open, and we are finally getting some much needed rain. So, I'm going to open the windows, enjoy the breezes, and sew. Maybe I'll do another post tonight, and show what I've gotten accomplished. I had a really busy week, and there were all kinds of plans to do blog posts about it as I went. But we all know the saying about the best laid plans......... I got lots done, just no blogging. I started a new quilt for Avery last week. 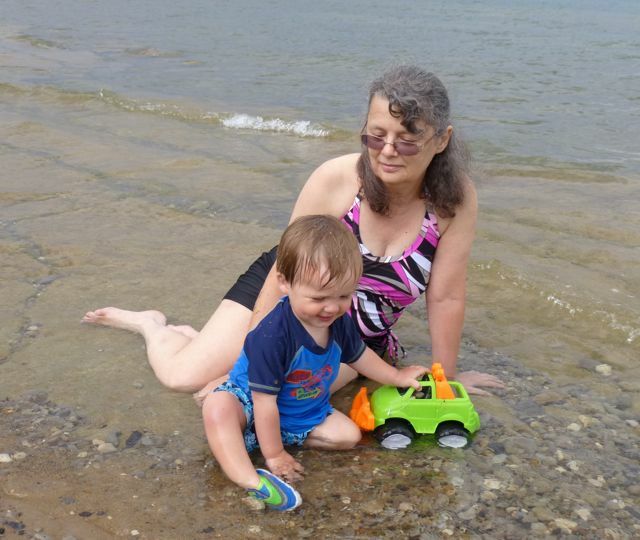 He loves his trucks, plays with them all the time, even at the beach. I've had a couple of layer cakes of fabrics sitting here for a while, waiting for an idea for how to use them. 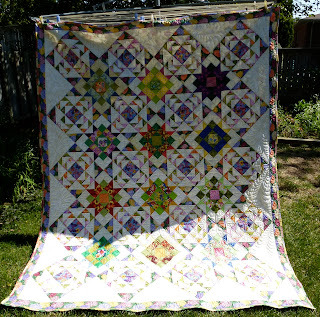 When I saw this Musical Pinwheels Quilt, designed by Jamie, I knew that was it. So, I asked if I could use the design, and she gave her consent. It's all from stash, using up lots of fabric. I didn't get a stash report done yesterday, so I'll do a double one this week. Anyway, there are a couple of fabric lines in this one, but I can't remember the names of them. I showed Avery some of the fabrics the last time we Skyped, and he was pointing at them and seemed to really like the colours and the subject matter. After the complexity of the Grandmother's Diamond Ring quilt, it was fun to do the very basic elements in this quilt. And fast, too. I worked on this while taking sit down and rest my legs breaks while working on a customer quilt last week. I had thought that I just might be able to get it done before we go up to see them on this coming Sunday, but that was overestimating the time I would have to do it, just a bit. I have no idea, at this point, what size it will finish out to be. There is all kinds of fabric left from the 2 layer cakes that are coordinating colours, but without the trucks. I might end up using them in some sort of borders. I'm just not sure what, at this point. I have some customer quilts scheduled in for the next while, so my sewing time will be limited to when I need to sit and rest my legs, which is actually when this one was done last week, as well. 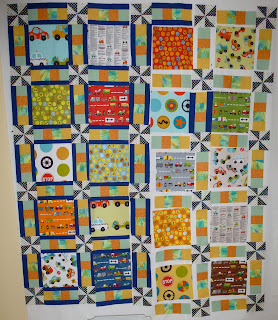 I'm linking up to Judy's Patchwork Times and her design wall monday post. Lots and lots of fun stuff to see. If it weren't for those design wall monday linky's, I wouldn't have seen this design. I love blogland.